As noted yesterday, there is a provision in Virginia law that allows citizens to force the courts to act against perpetrators of public nuisances when their local county prosecutor is, just for example, a corrupt partisan hack. Loudoun County commonwealth’s attorney Jim Plowman has made clear not only that he has no intention of enforcing the law against illegal advertising signs posted on the public rights of way, but has now taken the truly outrageous step of bringing criminal charges against a Purcellville couple who did nothing more than their civic duty of picking up this trash from the roadside. Plowman had them arrested and charged with trespassing and misdemeanor larceny. The latter is a charge usually applied to shoplifters. Both charges carry a prison sentence of up to 12 months and a fine of $2,500. Quite a punishment for removing trash from the roadway, especially when the accused couple state—and there is no reason to disbelieve them—that they were on public property all the time. 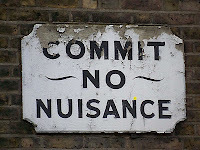 The legal concept of nuisance is a very old one in common law and there is a vast amount of case law on the subject of what is or is not a nuisance. But luckily for those of us who are fed up with sleazy real estate developers and other businesses fouling our county with their cheesy signs, Virginia statute explicitly defines posting such illegal signs as a public nuisance. (“Advertisements placed within the limits of the highway are hereby declared a public and private nuisance” is the exact wording of this clause.) You can read the full text of the Virginia illegal-sign law here: §33.1-373. Advertising on rocks, poles, etc., within limits of highway; civil penalty. Virginia law also provides a mechanism whereby if five citizens petition the circuit court setting forth the existence of a public nuisance, the court is required to summon a special grand jury to investigate their complaint. The perpetrators of the nuisance are liable to a fine of up to $25,000 and can be subject to a court order forbidding them to continue their illegal actions. You can read this law here: § 48-1. Investigation of complaint by special grand jury. The sign statue, by the way, also defines illegal signs as a private nuisance, which means an individual landowner could sue the perpetrators directly in his own civil action. With our elected officials now openly siding with the law breakers, to the extent of persecuting citizens who try to do something about this abuse of the law, it’s time to act.